A product design firm and durable goods production and logistics outfit, AARN is the diversified activity of Aaron Panone, self-producing designer and engineer. House brands include: AARN (custom product), AARN PLASTICS (eyewear design and manufacturing), and AARN TRANSMISSION (bicycle parts design and production). We found the perfect material, tested dozens of designs, and are excited to introduce our first mason jar coozie! It’s 100% made in the USA using a unique material made from recycled plastic bottles that we call Pfelt. Pfelt is made from 100% recycled felted PET for a reason: 51 billion plastic bottles find their way into landfills every year. It’s all part of our ongoing commitment to divert as much unnecessary waste from the landfill as possible. The Coozie features a textured screen printed pattern on the inside for a non-slip grip. A loop makes it easy to attach to the outside of your bag, and horizontal stretch webbing allows you to easily store a reusable straw, fork, or spoon. Our new patch on the front reminds us of what we’re preserving. 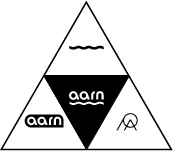 Designs and information contained on this website are the property of AARN, unless otherwise assigned.